When you navigate through the categories and subcategories on the left hand side, you will easily find the listing to match your needs. 60/120/200/240 pcs Wine Cups - Clear Plastic with silver base and silver rim. Capacity 7.5oz, 7 inches tall (simple assembly required). These Wine cups are REAL size cups and look like real glasses. 7.5 oz capacity, 7 inches tall. Check the pictures to compare them with a real glass and to other popular cups you see on the market and see the difference. 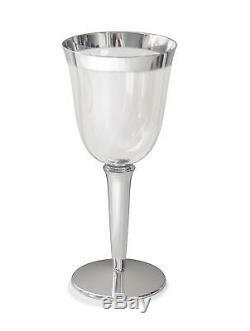 If you want to add equal qtty of our silver rimmed Champagne Flutes , please choose the correct option upon placing the order. (6oz, 9 inches tall, simple assembly required). The item "Bulk, Wedding Party Disposable Plastic Wine cups / glasses with silver base & rim" is in sale since Thursday, May 1, 2014.